The Ascetic harness is an armor set used by the Sangheili Ascetics. Its role is twofold: In combat, it induces fear in the wearer's opponents. It is also used by the Ascetics in ceremonial services. 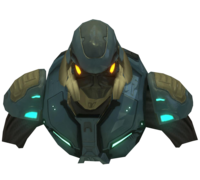 The Ascetic harness is utilized exclusively by the Sangheili Ascetic Corps, a group consisting of some of the most elite warriors within the Sangheili race. Only the highest-scored graduates of Sangheili military academies can be considered for placement in the Ascetics. Unlock: Unlock the Steppin' Razor Achievement. Description: "With the return of our sovereignty comes the much needed revival of the Ascetics; now more then ever our culture depends upon their resolve to help ensure stability." The helmet appears completely sealed. Two yellowish-orange bulbs mark the location of the wearer's eyes. If you look closely enough you can see slight bulges where the jaws are. Along the jaw-line and for about fifteen centimeters (six inches) beyond, extend two silvery tusk-like protrusions similar in design to those found on stealth Brute headpieces. These tusks also look strikingly similar to a Brute Spiker's blades. Judging by the description offered in-game, the helmet-mounted blades are likely meant to further augment the wearer's already frightening appearance. The helmet also comes with a white, flexible neck piece. Unlock: Unlock the Overkill Achievement. Description: "As the physical embodiment of ideological purity' an Ascetics' presence promotes feelings of stability and order; by example they will show each of us the true path." The shoulder pauldron is made up of a quarter-circle shape with two blue lights in them and a number of indentations. The shoulder pads appear similar to those of the standard body armor worn by the COG soldiers of Gears of War. Unlock: Unlock the Up Close and Personal Achievement. Description: "The Ascetic instills confidence in those loyal to the state and fear in those who would undermine it; to that end their actions are swift and their decisions final." Similar to the standard Combat harness. The only noticeable difference is a protrusion, shaped like the English letter "I", filling what would otherwise be a gap between the right and left breastplate. This chest plate is connected to the waist armor of the Elite. The combat advantages of this is unknown, but as an ergonomic feature it would seem to be designed to better the posture of the Elite, making them stand straighter and taller than other Elite counterparts. The body is possibly the easiest part of the armor to unlock as many players use melee attacks during games, easily getting them the Up Close and Personal achievement. Even though the Ascetic Helmet comes out farther than any other Elite helmet, it still has the same hitbox as any other Elite helmet, meaning the tusks have no effect relating to gunfire. However, they stand the risk of giving your position away to keen-eyed enemy snipers if they accidentally protrude from behind a corner. One of the first pictures shown of the Ascetic armor. An Elite in blue Ascetic armor. A side-view of the Ascetic helmet. A Sangheili serving under Arbiter Thel 'Vadam in 2558 wearing Ascetic armor. Sangheili mercenary Zef 'Trahl wearing Ascetic armor. The Ascetic harness in Killer Instinct. The Green Ascetic harness in Killer Instinct.